A good example is the section in the rules about damage. The rules describe the three types of damage that the corp player can inflict on the runner, but nowhere in the rules does it say how the corp player can actually do damage. That had me wondering for a while. Then I saw the card ‘Scorched Earth’ and realized that dealing damage is an effect of particular cards. The rules only need to explain the results. Anyway, here is my rules summary. It might read a bit cryptic, and doesn’t cover the layout or basic concepts, but it does have the ‘if this then that’ stuff. Corp loses if R&D empty and have to draw. Runner loses if flatlined (damaged and no cards, or zero hand size). Installed cards are not active until they are rezzed (pay cost & turn face up). ICE only rezzed when approached during a run. Agendas and Assets: only one of either per remote server (not both). Upgrades: only one ‘region’ upgrade per server, otherwise no limit. ICE: Installed in outermost position. Cost 1 per existing ICE. Can trash existing cards before installing. Programs: up to Memory Unit limit. Hardware: only one console, otherwise no limit. Agendas installed de-rezzed in remote servers only. 1 click and 1 credit to add advancement token. When fully advanced, score (free action). Rez and move to score area. 7 points win. Can advance assets if card text allows. Attack each ICE with icebreaker. Declare target server. Get credits for bad publicity. Approach ICE – jackout/end run?, corp rez anything?, if ICE not rezzed then pass. Encounter ICE – if icebreaker str >= ice str then pay cost to break subroutines in any order, unbroken subroutines resolve in order and may end the run. Jackout/end run?, corp rez anything? Access (look at) cards: R&D – top card (do not show corp) & upgrades, HQ – 1 random card & upgrades, Archives – all cards and upgrades, Remote – all cards. Put cards back the way they were, archives go back face up in any order. Steal accessed agendas (7 points win). Pay cost to trash any accessed cards. Trashed cards go into archives. Face up if rezzed, face down if de-rezzed. Corp initiates a trace on the runner. TraceX strength > Link strength = success, apply effect. If runner is tagged, corp can spend 2 to trash a Resource. 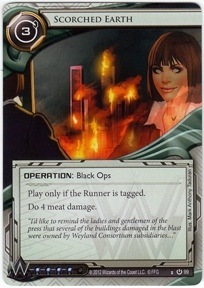 Meat damage: 1 random card from grip. Net damage: 1 random card from grip. Brain damage: 1 random card from grip and hand size reduced by 1. Flatlined: If more damage than cards in hand, or if max hand size is zero (from brain damage) then lose.